Anyway, if you've read through some of my Malbec reviews (check them out here) you may have noticed I tend to compare Malbecs to a few of my favorites, Layer Cake's being one and The Show being another. They're not the most expensive Malbecs, but they both are certainly good bang-for-your-buck wines. 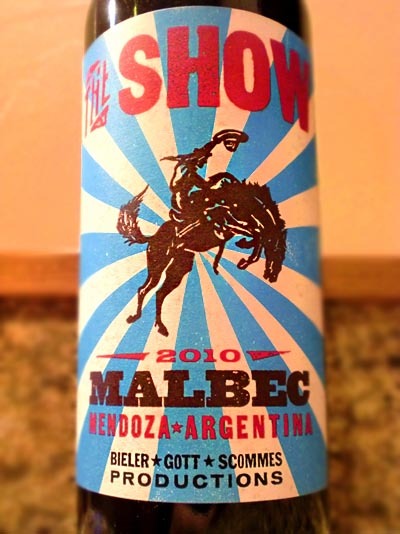 The Show Malbec is produced by Three Thieves which I take it is owned by Rebel Wines which is out of California. Despite this, The Show Malbec is made in Mendoza, Argentina home of many great Malbecs. 85% of this wine is from Lujan de Cuyo and the other 15% is from Uco Valley. If that sounds familiar, it is. I recently reviewed Diseño Old Vine Malbec which is made in the exact same two regions of Argentina. I'm wondering if there may be some overlap in the vineyards where these two wines are sourced (they're both good wines and similar, so I could believe it). Regardless, the wine is then aged for 9 months in 25% new French oak. The Show Malbec pours a deep purple and has aromas of blackberries, vanilla, anise, and a bit of florals. Tastings brings out more blackberries, blueberries, raisins, bits of clove, coffee, and cocoa, followed by an earthy and rustic finish. I consider this to be, like I said earlier, a great Malbec wine for the money. It has good, strong dark fruit flavors and depth followed by the classic Argentinian Malbec finish of earthy rustic soul-pleasing goodness. I know a few people who don't like the earth notes in good Malbecs, but I, for one, love them. Drink This: if you want a big, yummy, earthy Argentinian Malbec. It only costs around $12 a bottle, but tastes like other Malbecs that are $20+. Don't Drink This: if you don't like a dark red wine with a rustic, dusty, farmyard feel. Thanks for the nice review! As long as you keep drinking them, we will keep making them!! Thanks! !